Whiplash is perhaps the most misunderstood but common cause of head and neck injury. As a workers’ comp and personal injury firm around the big metropolis of Denver, we run into injuries caused by whiplash a lot. But because of a few bad apples simply trying to get a quick buck, there’s a lot of misconception about whiplash – most think it’s a minor incident when in fact it’s possible for it to cause long-term pain and suffering and be just as serious as any other back or head injury. For example, one of the symptoms of whiplash is neck discomfort, which is easy to fake and hard for doctors to dispute. Whiplash itself is characterized by violent movement of the head – first thrusting backward then forward very quickly – while the rest of the body is still. 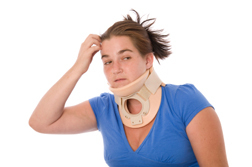 Whiplash is very common in rear-end auto collisions but can occur in many situations. And while most people associate whiplash as the injury, it’s actually just the cause and describes the movement of the head and neck. Some patients can also suffer from irritability, nervousness, memory loss and problems concentrating according to the National Institute of Neurological Disorders and Stroke. And while most injuries caused by whiplash are minor and heal quickly, some incidents can cause fracture and/or dislocation of the vertebra, which can cause temporary paralysis and permanent damage to nerves in the area. Chronic pain, headaches and spinal cord injuries are common symptoms for more serious whiplash incidents, which can take a long time to recover from.